All Saints’ Catholic School belongs to the Parish of All Saints in the Diocese of Shrewsbury. 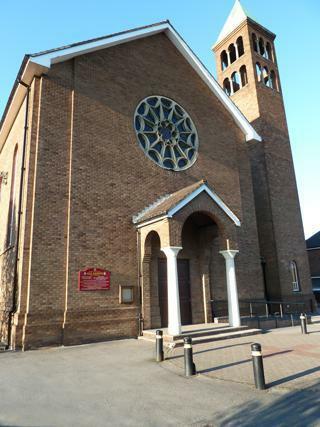 We are situated just behind the church on Carrington Lane and Fr. Ned Wall is our Parish Priest. Fr. Ned has been with us since September 2007. He not only looks after All Saints’ parish but also the parishes of St. Margaret Ward, Sale and Our Lady of Lourdes, Partington as well as their respective schools. Fr. Ned is helped by Fr. Bernard, Deacons Anthony and John. At the beginning of each academic year governors and staff from the three parish schools come together to host and celebrate Mass. This year Mass was held at St Margaret Ward on Friday 19th September. Afterwards the ladies of the parish provide a buffet at which there is opportunity to catch up and share ideas. For the children, the academic year begins with school children, families and parishioners joining together for a celebration Mass where Fr. Ned blesses the children’s school bags. The year ends with a special summer holiday parish mass where Fr. Ned blesses the children and their families and wishes them a safe and happy holiday. These close school and parish links support the children on their journey through All Saints’ from Nursery to Year 6 and culminate in a Leaver’s Mass during Year 6’s final week in school. Past pupils of All Saints’ play an active role in parish life as they continue through their secondary education. During term time, children from each year group prepare and lead weekly Mass in Church on Friday mornings at 9:15 am where they are joined by parents and parishioners. Some of the themes of recent masses have been St. Patrick’s Day, Hosanna, The Kingdom of Heaven is Near, We love our Mums and Friends are a Gift. During Advent and Lent children from Key Stage 2 attend Mass every Friday morning. At Christmas and Easter time, the children display their special gifts and talents performing and celebrating in church The Nativity and reflecting on the events of Holy Week. Each service is always very well attended by parents and parishioners. Little Church forms part of the Sunday liturgy at 9:30a.m Mass. On Sunday afternoons during Lent, the children are invited to Eucharistic Adoration which enables the children to discover the silent, loving presence of Jesus in the Eucharist. On Good Friday the Little Church leaders invite the children and parents to their Stations of the Cross Service. Each autumn, school collects tea, coffee, sugar and toiletries for a Harvest Festival Mass. Contributions offered are then donated to Cornerstone in Manchester. Each year the Ladies group at All Saints’ present the children taking part in the Sacramental Programme with communion medals at their Enrolment Mass and rosary beads on the occasion of First Holy Communion. The children’s artwork and names are displayed in church and the parishioners are invited to remember the children in their prayers. The All Saints’ folk group sing and play at the First Holy Communion Mass. Each year All Saints’ school has a Christmas Fair supported by parents and the Parish and in the summer there is a Parish Fair which is supported by school. School runs the bottle and chocolate stalls and sells raffle tickets. Several members of staff are Eucharistic ministers who help Fr. Ned during school masses and on Sundays. Members of staff are also Children’s Liturgists taking an active part in Little Church. Many boys and girls are altar servers and take part in Family Mass. The Friends of All Saints’ contribute to parish life by providing refreshments on a Sunday morning after church.